The Gossips, by Horace Bonham, 1885. 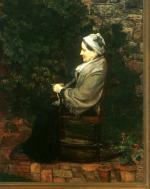 New England Woman (Mrs. Jedediah H. Richards, (Julia Leavit), by Cecilia Beaux, 1895. Slum Clearance on Ruch's Hill, Pittsburgh, by Virginia Cuthbert, 1937 . View from the Side Boxes (Opera), by Morton Schamberg, c.1910-11. Landscape, by Morton Schamberg, 1916. Sunlight and Shadow, by Walter Emerson Baum, 1925. Narrows, by Walter Emerson Baum. Duke Street Market, by Dorothy Lauer Davids, c 1944. 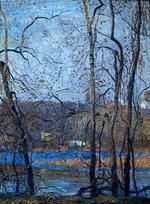 November Day, by Daniel Garber, 1918. God's Chillun, by Samuel Rosenberg, 1934. 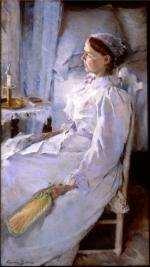 Portrait of Mrs. John Wheeler Leavitt, by Cecilia Beaux, 1885. Woodland Glade, circa 1870, by George Hetzel.